Times of the Islands – Nature’s Fireworks! Most of the photos you see in Times of the Islands depict sunny skies and cottony clouds floating over gem-colored seas and ivory beaches. But even paradise is not always perfect, especially during the summer and early fall months when atmospheric conditions are favorable to generate some short duration interrupting thunderstorms. Michael Bishop lives on Grand Turk and captured many of the images shown here during several blustery fall nights in the nation’s capital. Paul Kubecka, my dear uncle, has had a professional and personal interest in meteorology and weather observing for more than sixty years. Following is his tutorial on the subject of lightning that I think you will find fascinating. The Cumulonimbus cloud (Cb) is the generator of electricity that produces lightning which causes thunder (thunderstorm). The collision of small and large frozen and liquid precipitation carried by updrafts and downdrafts in the cloud causes the precipitation to become negatively or positively charged. When the charges between the cloud and ground become too great, there is a discharge of electricity called cloud-to-ground lightning. Lightning can heat the surrounding air instantly to 54,000ºF. From the base of the Cb a negative charge descends in an invisible zigzag pattern called a stepped leader. 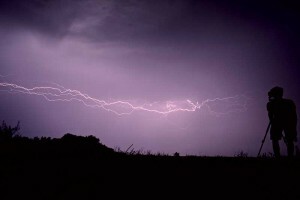 As this charge gets closer to the ground, a positive charge rises to connect to the negative and the lightning discharge is created. 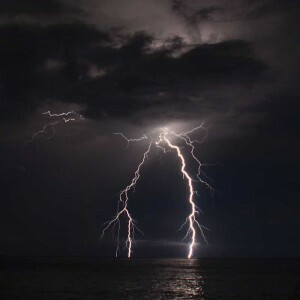 There may be several return strokes using the same channel, which give the lightning its flickering appearance and continues until all the charges in the cloud are depleted. Also, there is in-cloud and cloud-to-cloud lightning, which occurs between the opposite charges that are present in the cloud itself and between clouds. Cloud-to-air lightning normally occurs between the positively charged upper area of clouds to the negative air around it. Lightning does reverse direction. Ground-to-cloud lightning (upward lightning) occurs because of enhanced electricity gathered at the top of towers or skyscrapers during an overhead in-cloud lightning discharge. It is a discharge between cloud and ground initiated by an upward moving leader coming from tall objects on the ground. About 80% of lightning is in-cloud, and around 20% is cloud-to-ground. In severe storms and tropical Cbs, in-cloud discharges can be more than 90% of the lightning. More lightning (88%) materializes over land because it absorbs solar radiation and heats up faster than water, therefore the atmosphere is more unstable, which leads to the development of lightning and thunder. At dusk on June 30, 2014, Chicago’s three tallest buildings—the Willis Tower, the Trump Tower, and the John Hancock Center—were struck by upward lightning a total of 17 times. Lightning strikes the same place more than once. The Empire State Building in New York City on the average is struck 100 times per year! This in-cloud (rocket) lightning is streaking across the sky in Grand Turk. Lightning is a discharge of electricity that can heat the surrounding air instantly to 54,000ºF, five times higher than the sun. This rapid heating causes the air to expand explosively, creating a booming sound wave known as thunder. Lightning discharge diameters range from 1/16th to about 1 1/2 inches. Voltages range from one hundred million to a billion. A rumble of thunder is a relatively weak sound of long duration and a roll is occasionally used to characterize irregular sound variations. Updraft speeds in non-severe thunderstorms are about 15–30 mph; severe thunderstorms often have updraft speeds of 60 mph and a supercell updraft has been known to range from 150–175 mph. Typically, thunderstorm tops range from 25,000 to 40,000 feet but can vary by severity or geographic area. Tops of thunderstorms can tower to over 70,000 feet, and have been measured to 75,000 feet in the tropics and 78,000 feet in the US in Kansas. National Aeronautics and Space Administration (NASA) satellites collected data globally on the average yearly lightning flash rates per square kilometer (0.4 square mile). The average flash rate globally is approximately 45 per second or 1.4 billion per year, of which 25% reaches the ground. Around 78% of lightning is seen between 30º North and South of the equator. The Turks & Caicos Islands average about 5 lightning flashes yearly per square kilometer because of its small land area, and is the lowest in the region. However, nearby Chambellan, Haiti has about a 100 per year flash rate! The two places worldwide that experience the highest flash rates are Lake Maracaibo, Venezuela and Kabare, Democratic Republic of Congo, with slightly over 232 and 205 flash rates respectively. Each day about 40,000 thunderstorms occur and some 1,800 at any time of day throughout the world. Thunder can be heard to about 15 miles and over 60 miles in isolated instances. Lightning can strike to 10 miles from a storm. According to the World Meteorological Organization (WMO), “The world’s longest detected distance for a single lightning flash occurred over a horizontal distance of 199.5 miles on June 20, 2007, across parts of Oklahoma. Also, the world’s longest duration for a single lightning flash is a single event that lasted continuously for 7.74 seconds on August 30, 2012, over parts of southern France.” If the atmosphere is clear and there is an unobstructed view to the horizon, lightning from a Cb top at 50,000 feet may be visible to approximately 270 miles. Lightning advances electrical currents along the top of the ground that can be deadly to over 100 feet. When a discharge strikes water, it spreads out more than 90 feet. It kills or injures people and can hit boats that are nearby and electrocute fish that are near the surface. Heat lightning is lightning too far away for its thunder to be heard. Some thought that since there are no thunderstorms present, the lightning is the result of heat in the atmosphere, but this is not the case. Apparently, heat lightning got its name because it is sometimes seen on hot summer nights when the sky overhead is clear. The flickering often is an early alert that possible storms are approaching. Sheet lightning is lightning-produced cloud illumination that causes a sheet-like area of the cloud to become luminous. A lightning discharge transmits pure white light, but depending on different atmospheric pollutants, possible colors can be cyan, green, orange, pink, purple, violet and yellow. If there is rain or hail in the cloud, their colors are red and blue, respectively. How far is that lightning? When you see lightning, count the number of seconds until you hear thunder. Divide the number of seconds by five to get the distance in miles. The reason is that the speed of light is 186,282 miles per second, extraordinarily faster than the speed of sound (around 0.2133 miles per second). Lightning is seen almost instantly while it takes thunder a second to travel nearly five miles. There are estimates that 6,000 to 24,000 people are killed by lightning globally each year. In the US from 2006 to 2015, the average was about 31, with a 1 in 28,500 chance of being killed. • Height, isolation and pointed shapes are the prevailing elements affecting where a lightning discharge strikes. Avoid open fields, the top of a hill or ridge, and stay away from isolated trees or other tall objects. • Don’t go near water or wet items. Water and metal don’t attract lightning, but are good conductors of electricity. • Find shelter in a sturdy house or in a metal vehicle with windows completely shut. • Indoors, stay away from corded telephones, anything electrical and plumbing. Don’t stand near a window. • NO place outdoors is safe when thunderstorms are in the area. So when thunder roars, go indoors and wait until 30 minutes after the last thunder is heard. Now it’s safe to go outdoors.